peter pan collar tee; £12.50; american apparel via ebay. floral denim shorts; £28.80; topshop. cardigan; £63; carven via sample sale (almost cried at spending that much money). masquerade necklace; £9; elsie belle. skull bracelet; £11; made via ebay. blue and gold ring; £8; topshop. I've been blogging for a while now, I see it more as a way of sharing thoughts with people and getting to know others in a way more creative than sitting passively on Facebook or in a darkened, dripping room on a Friday night. I know that most of my friends don't "get it", and in all honesty I don't truly expect them to. Each to their own, and such. All I know is that I enjoy having a place where I can just offload my thoughts, share photos of outfits (normally purchased ridiculously reduced on ebay and from charity shops), and, most importantly, talk and have discussions with other bloggers (slow burning addiction to twitter, now obvious). As for me ("The Girl Behind The Blog", aha), I'm just about to start my second year reading English at the University of Liverpool, after having completed A Levels in English Literature, Art, German and History. I'm slowly getting more heavily involved with the university's magazine "Ellipsis", particularly the marketing and editing sides of things, which was founded last year. The media (specifically published, as opposed to radio and television) has always intrigued me, and my growing pile of magazines can be held testament to this. ps, i'm just off out for a nando's lunch (monday=20% student discount!!) and when i get home i'm going to make myself a very, very large mug of tea and reply to all your comments. are there any other blogs you recommend i look at? I love your new header, it's so cute! And I love your outfit! I haven't been on facebook in forever! Thanks for sharing this :) I love those shorts and yes, your new header is awesome! 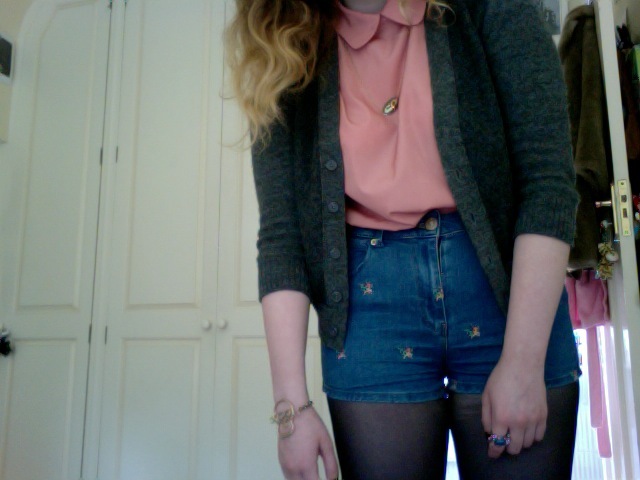 Lovely outfit- cute shorts and I love the colour of your top. Thanks for the comment! You've got a new follower! I just stumbled upon your blog through the Beckermans' and I have to say it's so nice to have been greeted with a first post that's also a little about you! A cool tee you have. I LOVE the shorts, those mini florals are adorable. Lovely post! I hope you win! Thanks for the sweet comment! I really like your blog. Love your shirt in the picture. I don't think it's important that your friends 'get' blogging, as long as they're supportive or at least tolerate it! What matters is that you enjoy it, and people on the internet get it because that's why they're on the internet, too. i love gthe pink shirt! Good luck with the comp. On a side note: your top is cuuuuuute! Wish you luck! You deserved it! love your accessories and good luck! Love your blouse. Please keep blogging.